Continuing with the baking, and my love of powdered sugar, especially vanilla infused powdered sugar. Vanillekipferl are an Austrian, German and Hungarian small, crescent shaped biscuits, that are usually made with ground almonds or hazelnuts, and flavored with vanilla, with a heavy dusting of powdered sugar. Traditionally, they are made at Christmas. They are said to have been created in the shape of the Turkish crescent to celebrate the victory of the Hungarian army over the Turkish in one of the many wars between the nations. It was this simple 5 ingredient recipe from "The Art and Soul of Baking" by Cindy Mushet, that inspired me. The only note I would add to baking these cookies, is not to wait until these cookies are completely cooled to roll them in the vanilla powdered sugar. I waited until they were warm enough to handle, but act fast, because they did cool down very quickly. 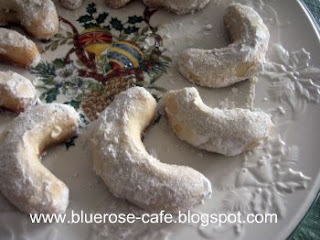 I am here now, blogging with a cup of hot green tea, and taking a bite of these delictable, buttery cookies. They have just the right amount of sweetness, with a wonderful vanilla flavor. 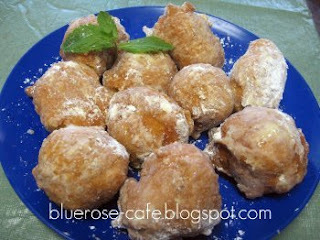 In an electric mixer, combine the butter and confectioners sugar for 5 minutes. Add vanilla, flour and salt just until combined. On a floured surface, spoon out tablespoons of the dough and roll into 3-inch strips. Form the strips into crescent shapes. Place cookies on parchment lined baking sheet and bake for 14-16 minutes (switching oven position halfway), or until the bottoms are golden and the tops are pale blond. In a small bowl , add the remaining half of the powdered sugar, (adding more as necessary), and roll warm cookies in it to coat. Set cookies aside to cool completely. If I had to choose which cookie is my absolute favorite, I would have to say it would be a tie between white chocolate macadamia and chocolate chip with walnuts. Next would be peanut butter, and then chocolate mint. At the very bottom of my list would have to be oatmeal. 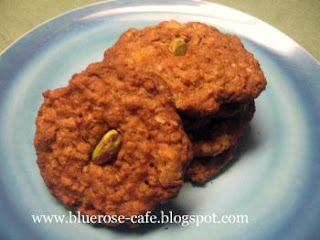 My husband loves oatmeal cookies, and I make them special for him all the time. Except when ever I take a bite from a cookie, I don't know why, something about the texture, I don't care for them. Even when I put chocolate chips in and raisins, doesn't make them taste any better for me. So when I came upon this recipe, From: Gourmet (October 2003) I had high hopes that this would become one of my favorite cookies, because of the sweet and salty combination with the apricots and pistachios. The one thing I did differently was I soaked my apricots in warm water for half an hour, to plump them up a little. My impression of this recipe after the cookies had cooled is, that if you like crispy, thin cookies than you will love this recipe. And even though I prefer my cookies more dense and moist, I did however like the flavors of this cookie, because the apricots came together well with the pistachios. It also had a really wonderful buttery rich flavor, that melted in your mouth. Which type of oatmeal cookie do you like? Thin and crisp, with chocolate chips or raisins, or are you like me with oatmeal being one of your least favorites. 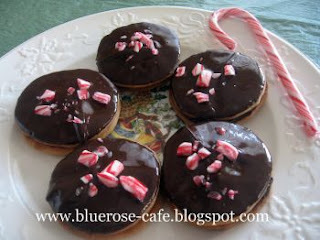 For the holidays, one of my earliest memories of baking, is of making these with my grandmother. I was so tiny I had to stand on a chair next to her. Watching her, in her apron completely covered with flour, as she cut the flour and butter with her pastry cutter. She would smile down at me and explain to me exactly what she was doing. It's from this memory that my love of baking comes from, and has become a tradition in my family to make these Raspberry shortbread bars with my daughters. What I found intriguing about this recipe, is the method in which the pastry is cut. After the dough has been chilled, it is grated into a buttered pan. I then, very gently pressed the crust together. It truly made a light, delicate and flaky crust. The only additions I made were to increase the amount of jam. 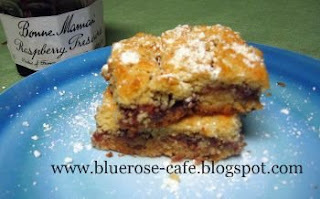 I remember my grandmother's bars being overfilled with jam,(or maybe it was her loved baked in, so I used a full 12 oz. jar of raspberry jam), and I would have also like to add slivered almonds on top. In a mixing bowl, cream butter and sugar. Add eggs, one at a time, beating well after each addition. Beat in extract. Combine flour and baking powder; gradually add to the creamed mixture. Divide into two logs, and chill for about an hour. Then, gently grate the first log, for the bottom crust. Very gently pressing it into, a greased 13-in. x 9-in. x 2-in. baking pan. Drop spoonfulls of jam, covering the bottom layer of crust. Gently grate the second log, over the jam, until it is completely covered. Bake for 35 minutes or until lightly browned. About halfway through, cover with foil. I’m sending these Raspberry shortbread cookies to Susan at Food Blogga for her Eat Christmas Cookies Season 2! Last year more than 200 cookie recipes were submitted. Looking for a great cookie recipe , check out Season 2’s round-up page for the new cookies submitted! If you have your own favorite recipe you would like to share, then make your own and submit it to Susan before the 21st! Have fun baking this Christmas! I like doughnuts, and I like them not only very warm, but frosted with plenty of powdered sugar. Maybe it's because I simply like sugar, and when I have coffee with my doughnuts, I don't have to sweeten my coffee, it's sweet enough after taking a big bite from the doughnut. What I love about this recipe, are the pumpkin, the spices, and the brandy all together combine to make this recipe fantastic. It was a perfect afternoon to make these. After I dissolved the yeast and covered the bowl, I set it out right by my kitchen window, with the warmth from the sun shining through it. If you are like me, it was hard for me to be patient, and wait for the dough to rise, but these Pumpkin beignets are well worth the wait. 1. First, proof the yeast to make sure it is active. After you proof the yeast, then add to it, a 1/4 cup more, very warm water, with the salt. Combine the dissolved yeast with 1 cup of the flour and mix until smooth. Form the yeast-flour mixture into a ball and place in a large bowl. Cover with a dishcloth and set in a warm place for 1 hour, until the yeast-flour mixture has doubled in size. 2. Meanwhile, beat the eggs until frothy. Add the remaining flour and the oil. Mix well with a wooden spoon. Let stand while the yeast-flour mixture rises. 3. When the yeast-flour mixture has doubled in size, combine it with the egg-flour mixture. Stir in the pumpkin puree and the brandy. Beat with a wooden spoon until the batter is smooth. Let stand for 1 hour. The dough should be elastic. 4. Heat the oil to 360 degrees. Be extremely careful, when using a soupspoon or a tablespoon, to drop spoonfuls of dough into the hot oil. Fry until golden brown, about 1 minute on each side. Drain the beignets on paper towels. While they are still warm, roll them in the powdered sugar. What could be better than a nice, comforting bowl of Potato-Leek soup on a cold winter's day. With it's velvety smooth texture, and the subtle onion flavor from the leeks, makes for a fabulous soup, truly anytime of the year. For my personal taste, I like to keep it simple. Using some potatoes and chicken broth I have left over, with leeks, butter to saute the leeks, seasoned with salt and pepper, that's all. The soup is creamy enough without adding any milk or cream, but if you like a richer soup, you can substitute some of the chicken broth for cream. 1. In heavy large saucepan over medium heat, melt the butter. Add leeks, slowly sauteing them about 10 minutes, until leeks are tender, stirring often. Add potatoes. Cover and cook, just until the potatoes begin to soften but do not brown. Again, stirring often, about 10 minutes. Add the 4 cups of chicken broth and bring to boil. Reduce heat, cover and simmer until vegetables become nice and tender, about 30 minutes. 2. Again this is a personal choice, I pureed my soup in batches with a hand held blender or you can use a processor until smooth. OR you can leave some of the soup chunky, if that's the way you like your soup. If your soup is too thick, you can thin it with more broth, or cream. Season with salt and pepper.